You can check out all of their product at their website here and here are the instructions for handling and baking the Butter Braid Pastries. 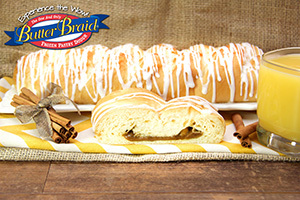 Now for the best part Butter Braid is giving away a 6 pack to one lucky reader and they will get to try the wonderfulness of these great products! but I really want to try Butter Braids Double Chocolate. My favorite is napoleon pastries. A cheese danish! With either cherries or raspberries! My favorite pastry is any with chocolate! My favorite pastry is cinnamon rolls.